Dr. Paula Gant, the Deputy Assistant Secretary for Oil and Natural Gas at the Department of Energy, touts American natural gas and explain’s her agency’s role in exports. 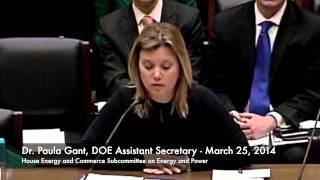 The discussion took place at a March 25, 2014, House Energy and Commerce Subcommittee on Energy and Power hearing entitled, H.R. 6, the Domestic Prosperity and Global Freedom Act. H.R. 6, sponsored by Rep. Cory Gardner (R-CO), would essentially remove the Department of Energy’s public interest review of liquefied natural gas exports. The issue has become controversial as the DOE faces a backlog of applications with no clear timeframe for processing. Republicans lined up behind Rep. Gardner’s bill, while Democrats largely argued that the current DOE process should remain in place. Most House committees seem to post videos of their hearings. Paula Gant’s FE has already authorized three LNG export operations right at the end of the Transco -> Sabal Trail -> FSC pipeline and FERC is considering a fourth one. Why should this fossil fuel industry profiteering justify eminent domain?